MUMBAI: Members of the Backstreet Boys pop group surprised their fans with an elevator sing-along of their classic hit songs. They gave unknowing fans the ride of their lives during a visit to the TRL studios, surprising MTV employees for a segment dubbed TRelevator, reports people.com. Brian Littrell started off the prank, riding the elevator solo when three women enter wearing Backstreet Boys shirts - and immediately recognize the band member. They exchange a few words, but the women really start to lose it when Howie Dorough and Kevin Richardson get on a few floors later. Not long after, A.J McLean and Nick Carter catch a ride, and cluing the girls in that they're part of a staged gag. Another woman enters the elevator shortly after, immediately exclaiming, "Oh my God! What is happening?" After some encouragement from their fan, the entire group belted out their classic I Want It That Way. But they weren't the only fans to experience the shocking private concert. The Backstreet Boys welcomed many fans to join them in the cramped space - where they performed more of their best-known hits like Everybody (Backstreet's back) and As Long As You Love Me. MUMBAI: Pop group Backstreet Boys have shared the most surprising thing that people will find at their Grammy Museum exhibit. MUMBAI: Singer Baylee Littrell will be joining his father Brian Littrell and the rest of the Backstreet Boys on the North American leg of their DNA World Tour this summer. The young artiste says it's always been his dream to go on a tour. 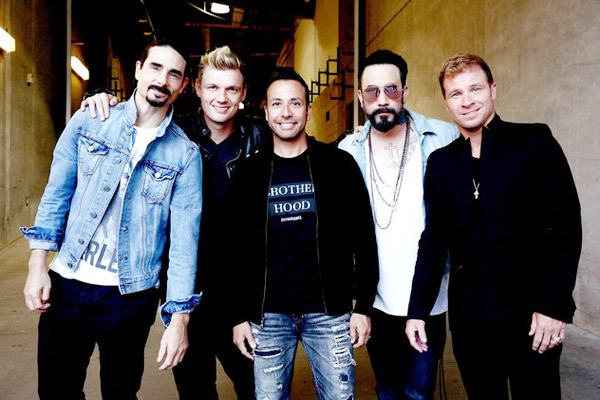 MUMBAI: The Backstreet Boys have formed over 25 years ago and the pop group's member AJ McLean feels their shows have gotten a little bit bigger than before. MUMBAI: Backstreet Boys have dropped DNA their favourite album.